My daughter wanted a a small cross-body messenger bag that she could use to carry her larger headphones, phone and wallet. 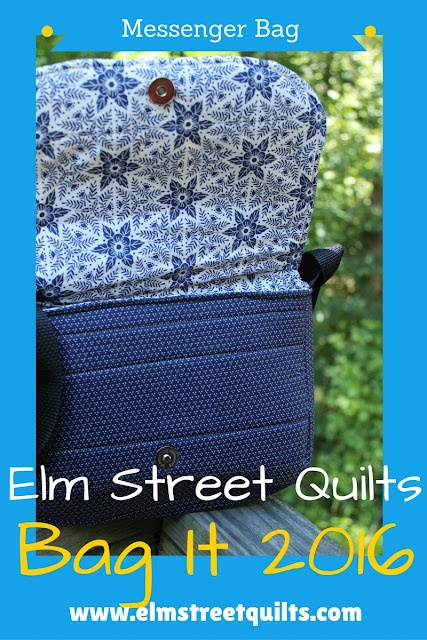 This is a simple messenger bag tutorial that you can enhance with pockets or perhaps enlarge. My daughter is barely 5' tall so the instructions for the strap allow you to adjust to the size you need for your special person. I would not recommend this tutorial for a beginner as the construction involves multiple steps and assumes some knowledge of bag construction. 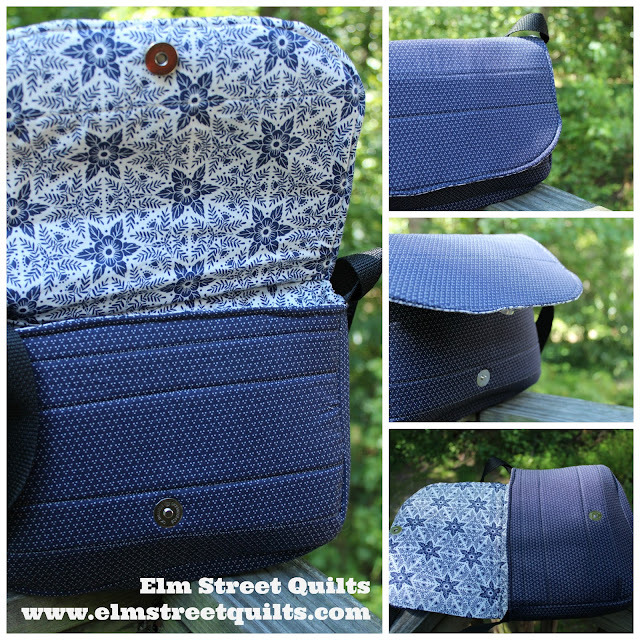 The Messenger Bag finishes 10'' wide, 8'' high and 1 1/2 '' wide. See below for fabric credits. The bag is constructed from three pieces - the back panel (includes fold-over flap), the front panel, and the side panel. Place the primary fabric for the back plus flap panel onto the same sized piece of the stabilizer. Quilt straight lines across to secure. 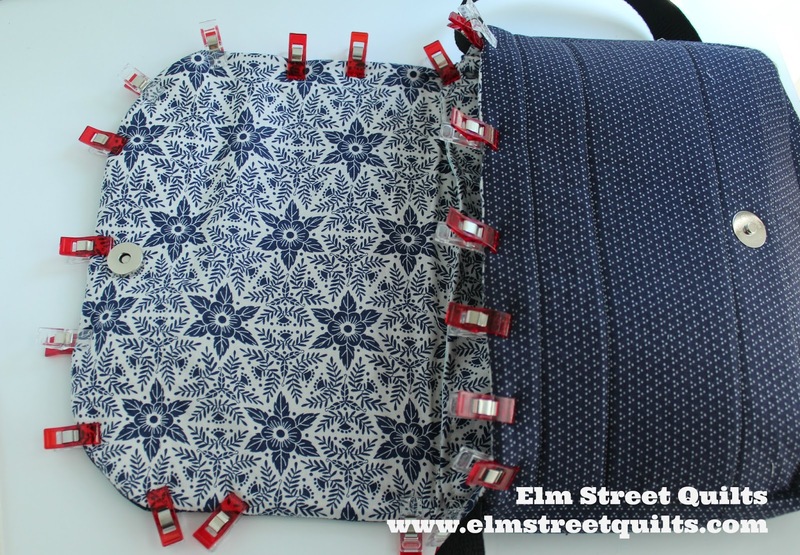 For my sample, I choose to place a few well spaced quilting lines. Repeat this process for primary front panel using piece of same sized stabilizer. For the side panel, I pieced two (2) smaller lengths of fabric to get a piece 24 x 2''. Place side panel on same sized stabilizer and secure with straight lines of stitching. The bottom edges of front panel and all four (4) corners of back panel including fold-over flap will need to be rounded. Using a small bowl and trace around edge of bowl to round off edge. To make sure these were all sized the same, I traced the bowl on one (1) corner, cut out that corner and then used this as a template for the other five (5) corners. Assemble (if necessary) side panel from lining fabric to construct a lining side piece 24 x 2''. The lining construction uses an additional piece of fabric - the lining flap panel, the lining back panel, the lining front panel and the lining side panel. As for outer bag, round the corners using that same small bowl or the template you created. the two (2) top corners of the lining flap panel. the two (2) bottom corners of the lining back panel. This tutorial on magnetic snap installation provides step by step instructions with photos on installing magnetic snaps. 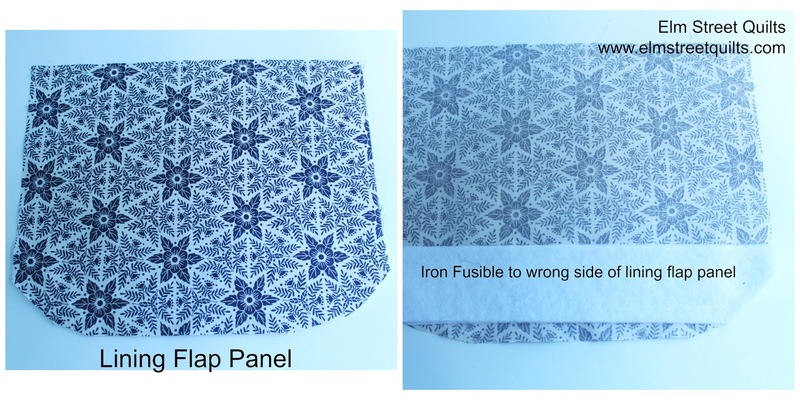 Install magnetic snap on lining flap panel. On right side, place a mark on right side 5 ¼ '' from each side and 1'' from side with rounded edge. Mark center of bottom of primary back (plus flap) panel and mark the center of primary side strip. Align center markings and pin carefully around bag. 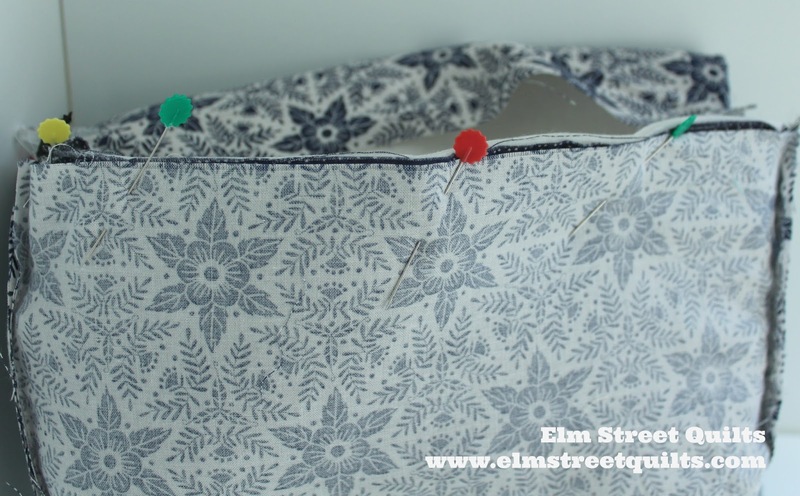 Sew using ¼'' seam. Right sides together pin the lining flap to the bag flap. Sew around edge stopping and back-stitching at bag edge There should be approximately an inch of extra fabric which will not be attached. Turn flap right side out. Tuck extra fabric inside bag. Pin other end of strap to bag and audition strap length to best fit height of user. When correct length is determined, sew second side of strap, being careful not to twist. Take to your machine and sew from back seam of side panel, across side panel, across front panel, across other side panel. You do not sew the back panel. It will take a bit of maneuvering around your machine but take it slow and all will be fine! Turn right sides out. Around flap edge and front bag edge, secure with binding clips. Sew a line of top-stitching around edge. You'll need to move slowly and just move the bag and you go. I was able to do this without any issue. Tuck flap lining behind back lining piece. 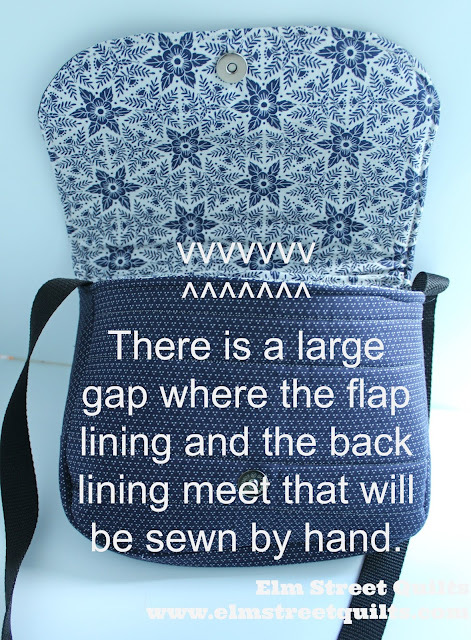 Fold over edge of back lining piece by ¼ '' and close opening with small stitches by hand. The fabric is Clothworks Cherry Mint and was gifted to me by the designer Reika Hunt. I used a dark print for the outside and a white and blue print for the lining. I'll be linking my Bag It tutorial with Main Crush Mondays, Sew Cute Tuesdays, , Freemotion by the River, WIP Wednesday's, Let's Bee Social, Midweek Makers. Fabric Frenzy Friday, Finish it Up Friday and Finished or Not Friday.